TASK AT HAND: This week I’m thinking about control. The desire for control is commonplace and, overall, we hope to exert positive or beneficial control in the actions and events that take place in our lives. The hope is that we can “guide” strategies towards desired outcomes. Control becomes a surrogate for ends and outcomes. You can see this is a reasonable and somewhat rationale thought process. However, let me introduce you to the cognitive bias of the illusion of control. This is a habit where we overestimate our ability to control events. The effect is named by psychologist Ellen Langer and has been demonstrated in numerous different experiments. As we find ourselves in stressful and competitive situations, this type of bias increases significantly. Sports are common examples where a participant “believes” that he or she can make the basket or score the goal. In reality, once that ball leaves the shooter’s hands or launches from their foot, all control is foregone. There is no control that can be exerted beyond that action. Another example is financial markets where an investor is “sure” they can make a profit on a particular trade. For the latter, he or she has almost zero control over the outcome of that stock price or bond dividend. So, what does this mean for our strategies and plans? 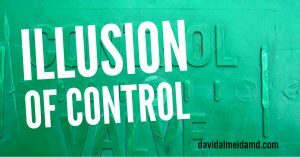 Do we just relinquish all control? No, as with all types of biases, we need to learn to detect it and minimize it’s deleteriously effects. For the illusion of control, one can overcome this type of bias by focusing on processes rather than prediction of outcomes. I like reminding myself of the adage, “the ends do not justify the means”, to realize that I cannot control ultimate ends but I can influence the means and processes via a conscientious connection with acts. This liberates you from the stress of trying to control the outcome and allows you to deliver the best possible action or strategy. Try it! 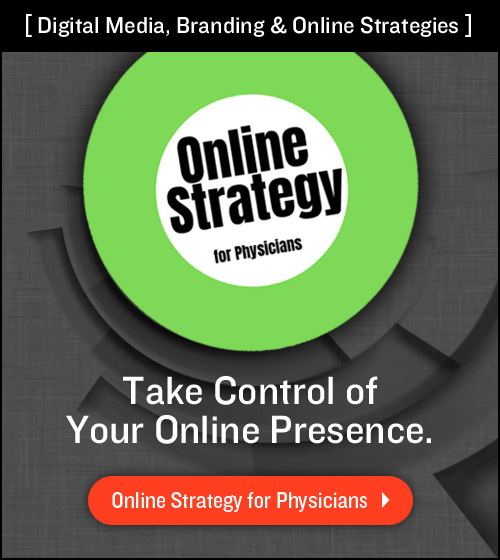 MEDICINE & MACULA: Many thanks to Jim Beach (@entrepreneurjim) for having me on the School for Startups Radio! Jim’s philosophy on entrepreneurship is refreshing and you can hear me on his June 22 episode here. TASK AT HAND: This week I’m thinking about scars. 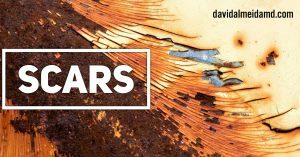 We normally think of scars as negative manifestations of past trauma. Sequels of serious harm. Instances where circumstances went beyond our ability to repair and restore our normal constitution. Whether they be physical, psychological or spiritual, scars are commonly unwanted tattoos of dramatic life events. But this view is nearsighted. As the insightful Pat Benatar quote echoes above – you, your body, your face and your smile – are reflections of the life you live. The scars you collect speak volumes of the miles you travel, the milestones you achieve, and the pain you reconcile. These are, whether negative or positive, the greatest hits of your life. The scars you collect are essential elements of your constitution; consequently, they should be celebrated for, so strong an effect they have, they change you forever. Don’t hide from your scars! There is no need for that “perfect face and body” Benatar alludes to above. Instead, embrace scars, imperfections, and stains. Actually, let me go one more: welcome the opportunity to develop new scars! Challenge your character and choices in ways that provide opportunities for personal growth and the ability to foster new relationships. When life pushes you, push back. When you are held down, the only next move is to get back up. When you are questioned, answer in the affirmative. Answer without fear of scars. MEDICINE & MACULA: Check out one of our recent publications, Dysfunctional Autonomic Regulation of the Choroid in Central Serous Chorioretinopathy by C Nathaniel Roybal, Elisabeth Sledz, Yasser Elshatory, Li Zhang, David RP Almeida, Eric K Chin, Brice Critser, Michael D Abramoff & Stephen R Russell. It was published in the June 2017 issue of RETINA. You can find the study here. 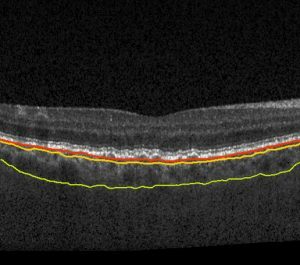 We describe the effect of changing perfusion pressures on retinal and choroidal structure in central serous chorioretinopathy (CSC). In this study, we found that choroidal thickness increased in response to increased perfusion pressures in patients with CSC and not in normal controls. These findings likely represent an autonomic dysregulation of choroidal blood flow in patients with CSC. GRATIS: Happy Father’s Day to the selfless individuals who, without fear, serve as mentors and role models! TASK AT HAND: This week I’m thinking about the concept of asynchrony. 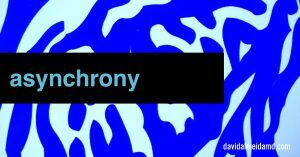 Asynchrony is a common term in computer science where it refers to events occurring at different times that are independent of the primary program. In biology, asynchrony pertains to the ability of a species to fluctuate in their evolution over time. As Bluthgen and colleagues have shown, asynchrony affords animal or plant communities the ability to fluctuate beyond biological diversity (Nico Bluthgen, Nadja K. Simons, Kirsten Jung, et al. (2016) Land use imperils plant and animal community stability through changes in asynchrony rather than diversity. Nature Communications 7, 1069. doi:10.1038/ncomms10697). The authors write: “The more the species in an ecosystem fluctuate in their evolution over time, the less they are likely to falter.” Think of these fluctuations as asynchronous behaviours. So, what is the relevance of asynchrony for us here on the Sunday Surgical Scrub? I define the term of asynchrony as relationships occuring at different times. These relationships may not be apparent because of their disparate temporal profiles; i.e., they do not occur at predictable times. Like a plant that can fluctuate its uptake of solar energy depending on its external conditions, your ability to act asynchronously with your environment can provide you with a strategic advantage when encountering complications or conflicts. For example, take a situation where someone submits a work or community proposal and that proposal is met with resistance or outright denial. A synchronous response would entail countering with similar resistance amidst negotiation. This is a reasonable approach and appropriate in some circumstances. However, one could also try responding with an asynchronous strategy such as delayed deliberation. This will create a window of time that may, in turn, change the circumstances of how your proposal is met. Please note that this is not simply procrastination or delay for the sake of delay. Instead, you will alter your plan or proposal over a longer timeline so as to align with changing factors that may improve your chances of succeeding in your ultimate pitch. Take another example; let us assume you have multiple investments and the market bears significant losses. A synchronous response would be to pull out and sell before you incur further losses. Instead, an asynchronous response would entail diversifying your portfolio to have a more robust defense against further market losses. By diversifying, you are responding with a relationship that will be most relevant to a later time frame when the market changes. As you consider the varied applications of strategy, be on the lookout for the opportunity to utilize asynchrony. Look for diversity and relationships over courses of time that may appear to be unrelated. This will afford you greater stability towards success in your overall goals. 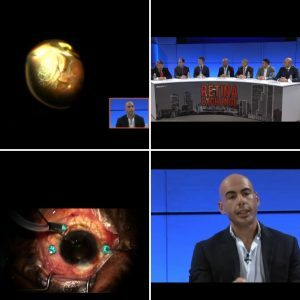 MEDICINE & MACULA: Many thanks to Don Hutcheson for having me on the fantastic podcast, Discover Your Talent–Do What You Love. I was featured on the episode, More Effective Decision Making, that went live Friday, June 2. 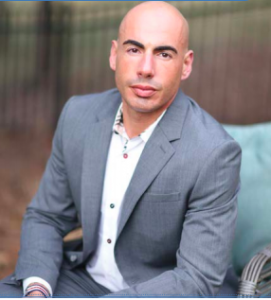 Check out Episode 512, Expert Interview: More Effective Decision Making with David Almeida here. You can access the podcast, my episode 512, and show notes here. The website page of Discover Your Talent can be found here. iTunes (episode 512) is here. Stitcher (compatible with Android phones and all computers) is here. 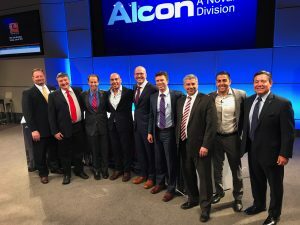 GRATIS: This past week, on Tuesday June 6th, I had the privilege of being part of a terrific panel of vitreoretinal surgeons in Dallas-Fort Worth looking at complicated surgical cases. There were terrific videos and discussion and I had a great time seeing outstanding colleagues. I contributed a video on proliferative vitreoretinopathy which, as many of you know, is a serious academic interest of mine. Aware of who you are. TASK AT HAND: This week I’m thinking about awareness. 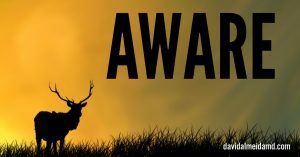 What does it mean to be aware? Take the simple picture above of an animal and their surroundings. Is there awareness of self, of season, of a hunter in the distance? Or is awareness less complicated and a function of assuming the emotion of the moment? From my vantage point, awareness is “situational knowledge”; i.e., insight into an instance in time. There are 3 types of awareness needed for self-realization, understanding and the application of successful strategy. First and foremost, you must be aware of yourself. What are your core beliefs? What are you in pursuit of? What mores and values do you ascribe to? This is a non-negotiable aspect of awareness. You absolutely need to know this because this will function as the compass of your life. It will guide your actions through conflict, it will instruct your decisions when pondering questions, it will be your strategic Virgil as you navigate the circles of life. Second, you must be aware of your surroundings. Without knowledge of the space you occupy, you risk disconnection from your environment. Your environment includes everything from physical objects, to geography, to people. Proper awareness of your surroundings will allow you to be considerate and conscientious of how you move through space. Your impact on relationships are very much a part of your environment. Lacking awareness of this fragments our bonds and hinders our ability to mature our contact with the world around us. Finally, aware of concept relates to how we apply knowledge. For example, understanding a concept or piece of information and successfully applying it are two very different items. Many times, you will see examples of individuals having correct conceptual understanding but failing in application. These examples occur in personal relationships, business strategies, and political undertakings. In my opinion, to take a concept, and then successfully apply it requires awareness. You need to be aware of yourself, your environment, and how the knowledge in questions must be applied. This is analogous to working “in context”. If you are out-of-tune or lack situational knowledge – if you lack awareness – I doubt you will be able to successfully apply a concept through application. So, the call to action on today’s Sunday Surgical Scrub is seek awareness. Constantly evaluate the multi-dimensional matrix of awareness in the spheres of self, environment, and concept to best guide your actions and strategy. MEDICINE & MACULA: Many thanks to Michael Brun for showcasing me in the Woodbury Bulletin. You can check out the article entitled, A cure for procrastination: Surgeon combines diverse background in decision-making framework, here.